Formed from French roots, livened with Spanish spices, inspired by African vegetables, caribbeanized by West Indian hands, laced with black pepper and pork by the Germans, infiltered with potatoes by the Irish, blasted by garlic and tomatoes by the Italians. New Orleans cuisine is a rich melting pot of influences and ingredients, and Pearl’s embraces the roots of both Cajun (rural) and Creole (city) styles of cooking. We offer authentic and enduring southern specialties like Etouffé, Jambalaya, Oysters Rockefeller and Fried Green Tomatoes, alongside crawfish, shrimp and other fresh seafood. 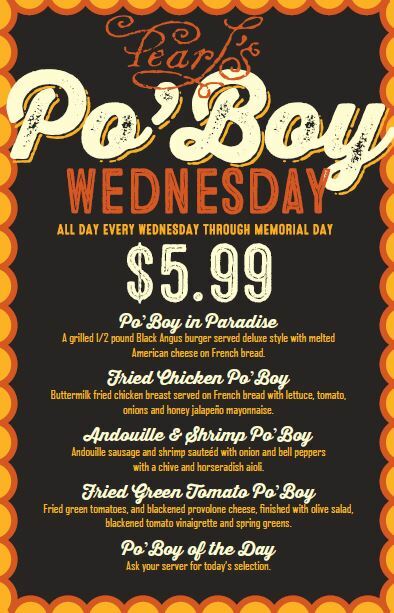 Learn the right way to eat a crawfish, enjoy a New Orleans style Po’ Boy sandwich, or step out and try some blackened alligator! New Orleans is the birthplace of the cocktail.  Embracing that tradition, Pearl’s features an array of unique libations including house-steeped Margatinis, seasonal spins on martinis, manhattens and cosmos utilizing house-infused liquors, an extensive Bourbon menu, wines by the glass or bottle, and a fun selection of Louisiana & local micro-brews on tap. Pearl’s features two outdoor porches; a deck area for guests to enjoy beverages while waiting to be seated, and a covered patio with table service. All items on this menu are celiac friendly. All menu items are processed in a facility that also processes wheat products or are purchased from retailers that also produce wheat based food products. A 23.5 ounce cocktail served in a tall glass shaped like a hurricane lamp, with dark rum, light rum and fruit juices. Orchard cherries blended with tequila, Michigan Cherry Liqueur, lemon and lime, shaken and served over ice. Sauza Conmemorativo Tequila, Grand Chevalier and fresh squeezed sour mix, well shaken. Tequila shaken with fresh squeezed sour mix and triple sec served on the rocks. Pearl vodka, pom liqueur, Cointreau, fresh citrus and pom juice, shaken and served up. Made with Luskowaska or Monopolowa Potato Vodka shaken and served up or on the rocks. Bourbons are whiskeys that are distilled from a ‘mash-bill’ (recipe) of no less than 51% corn, with the remaining grains being either rye, wheat or barley. Bourbons must be aged for a minimum of 2 years in new, white oak barrels that have been charred. All Bourbons are distilled to a minimum of 120 proof not to exceed 160 proof, then are ‘cut’ to the desired proof out of the barrel. Nothing can be added at bottling to enhance or alter the flavor, sweetness or color. The taste of a Bourbon is affected by its ‘mash-bill’, age and proof. Other factors include; blend, aging, warehouse location and the amount of barrel char. Common Bourbons are a mixture of many different barrels and ages blended to a specific ‘mash-bill’ created by the Master Distiller in order to maintain a consistent taste profile. The age stated for each Bourbon reflects the minimum barrel age used in the blend. Single Barrel Bourbon is made from a single barrel. The Master Distillerwill use only barrels from the absolute best aging warehouse locations. The age stated reflects the actual barrel age used in the bottling. Small batch are blends that utilize only a few select barrels. The Master Distiller will use only the finest barrels, from choice aging warehouse locations when crafting these specialty Bourbons. The age stated refects the minimum barrel age of the Bourbon used in the blend. Expand your Bourbon palette and try one of our flights of premium Bourbon. We present three 1/2 ounce pours together so styles and tastes can be compared. Made from a mash of at least 51% rye, the other ingredients are usually corn and maled barley. It is distilled to no more than 160 proof, then the whiskey goes into charred, ne oak barrels at not more than 125 proof. Rye Whiskey aged for at least 2 years may be further designated as “Straight Rye Whiskey”.  Antoine Amedee Peychaud, a French refugee from Santo Domingo, arrived in New Orleans with a secret formula for a tonic, which he called bitter. Peychaud opened an apothecary shop in the Vieux Carre where he served his concoction with cognac. The potion was served in an egg cup, or “coquetier”. Americans often mispronounced the word and it evolved into Cocktail. Ask your server about today’s Margatini or Pearl’s Infusion feature! Absinthe, sugar, bitters, bourbon, shaken over ice and served up with a lemon twist. Gin, vodka, Bacardi Limon rum, with a splash of Sprite, served on the rocks. Peach–infused premium True North vodka over muddled fresh basil and cucumber, shaken with a splash of home-made sour and soda. VERY refreshing! 10 Cane rum muddled with fresh basil and blended strawberries, finished with a splash of soda. Jim Beam bourbon, fresh mint, sugar, splash of soda, served on the rocks. Jack Daniels, fresh mint, blended strawberries and lemonade, shaken and served on the rocks. Garnished with a blue cheese stuffed jalapeno, crawfish & pickled carrots, rimmed with Creole seasoning. Using a traditional absinthe drip over a sugar cube. Jalapeno tequila, orange juice and a splash of fresh squeezed sour mix, shaken and served up with a jalapeno salted rim. Cuervo Gold tequila, Cointreau, Grand Marnier, fresh squeezed sour mix and a splash of orange juice. Shaken and served over muddled citrus. A fresh shucked oyster, jalapeno steeped vodka and cocktail sauce. Premium Sauza tequila steeped for a minimum of 3 days in a variety of seasonal fruits. Add a splash of fruit liqueur and our fresh squeezed sour mix. Served up like a martini. House-infused premium vodkas,bourbons or simple syrups in creative combinations put unique spins on the classic martini, manhattan or cosmopolitan. A rotating selection of premium Michigan Microbrews! Skyy vodka and jalapeno spiked vermouth, shaken and served up with a blue cheese stuffed olive. Jalapeno-steeped vodka, dry vermouth, splash of olive juice with a blue cheese stuffed olive garnish. Bulleit bourbon, sweet vermouth and bitters, shaken and served up with a twist. Smirnoff Citrus Vodka, Cointreau, Chambord and cranberry juice served up in a chilled glass. 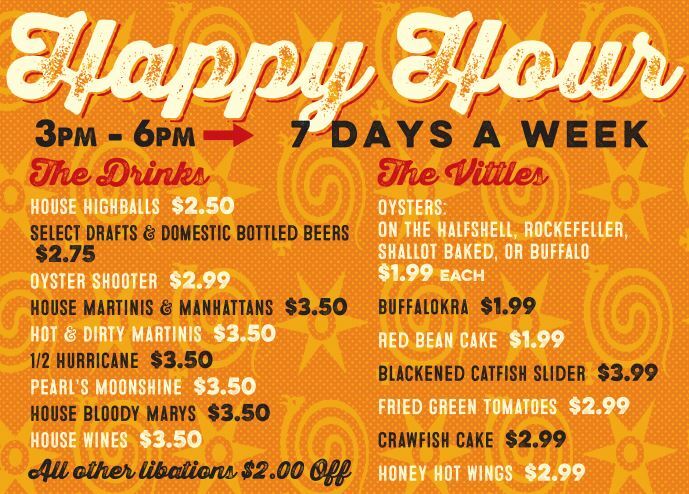 Stop in from 3 – 6pm any day of the week for House Highballs $2.5 | Select Drafts & Domestic Bottled Beers $2.75 | Oyster Shooter $2.99 | House Martinis & Manhattans $3.50 | Hot & Dirty Martinis $3.50 | 1/2 Hurricane $3.50 | Pearl’s Moonshine $3.50 | House Bloody Marys $3.50 | House Wines $3.50 | All Other Libations $2.00 off! 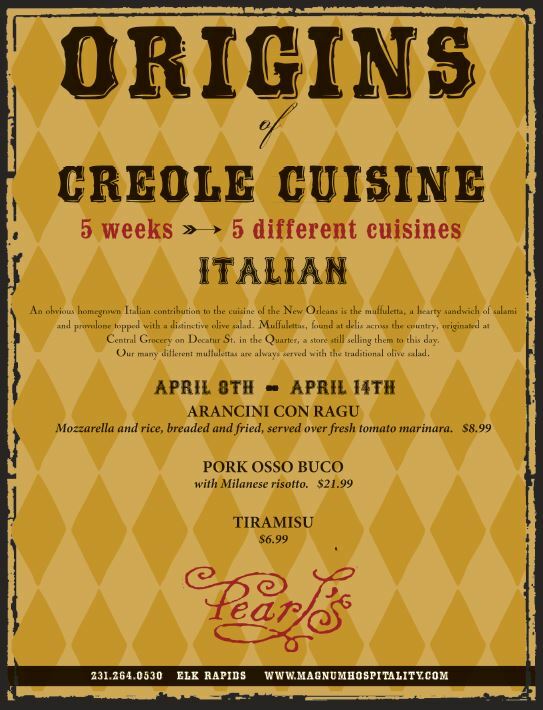 Origins of Creole Cuisine Menu Series: 5 weeks, 5 different cuisines! Creole cooking revolves around the very diverse cultures that make up Louisiana. 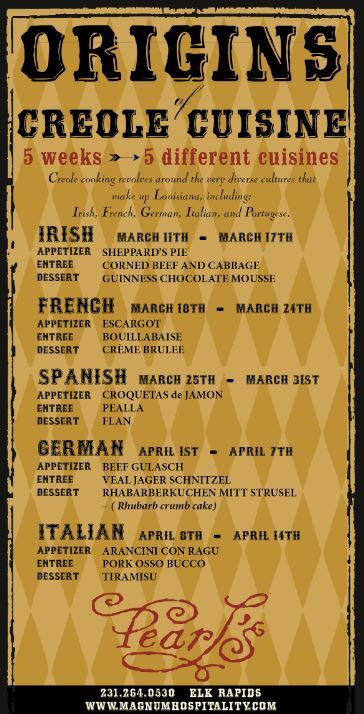 Join us as we take a tour of these regions with some fantastic dinner features! Pearl’s is cookin’ with bourbon! Featuring a unique menu inspired by the only truly “American” spirit. Sip from our bourbon list with over 40 selections! Benefiting N.M.C. Culinary Program participants. Proceeds are being used to permanently endow a scholarship fund in memory of Missy Kamyszek.  Missy was a beloved manager at Pearl’s sister restaurant, the Red Mesa Grill, who passed away tragically in 2004. Since 2005, over $83,000 has been generated for the endowment, with 13 scholarships awarded to date. All proceeds from Missy’s Favorite Drink Feature will be donated! House Highballs $2.5 | Select Drafts & Domestic Bottled Beers $2.75 | Oyster Shooter $2.99 | House Martinis & Manhattans $3.50 | Hot & Dirty Martinis $3.50 | 1/2 Hurricane $3.50 | Pearl’s Moonshine $3.50 | House Bloody Marys $3.50 | House Wines $3.50 | All Other Libations $2.00 off! This ain’t no buffet! Eggs ain’t made to sit around! That’s why at Pearl’s we serve our Brunch Menu up fresh. 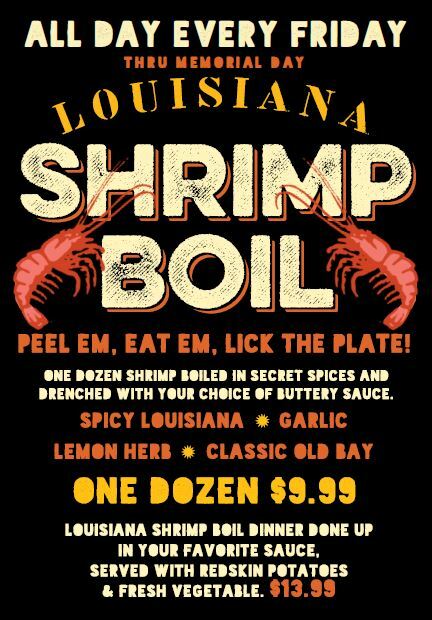 The best Cajun n’ Creole cookin’. Crawfish Benedict, Creole Omelette, and Eggs Sardu all served with a warm side of Southern Hospitality. A year-round program. 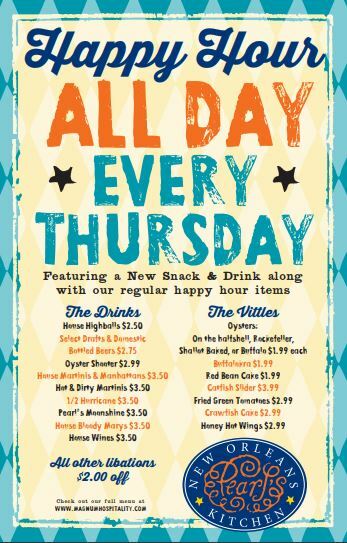 On the first Thursday of each month Pearl’s donates 5% of gross sales to the Elk Rapids Community Cupboard. Since inception, Magnum Hospitality’s Help Everyone Eat program has generated over $133,000 for northern Michigan food pantries. Thank You!